In production department garments are stitched by sewing machines. Stitched garments are finished in the finishing department. Finishing activities are performed prior packing garments into poly bags. The major activities of a finishing department include thread trimming, checking garments and ironing. The folding, tagging and packing of garments are done in the packing section in the finishing department. 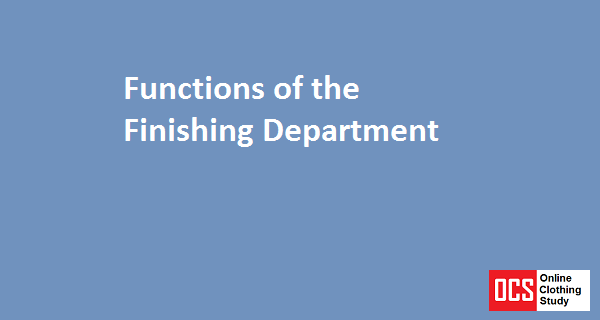 This post covers major functions of finishing department. Mind these functions may vary while there is a change in product categories. In stitching department thread trails and thread chains are not trimmed neatly. Uncut threads and thread tails in garments are trimmed in the finishing department by helpers. Uncut and loose threads on garments are considered defects. All garments are checked at the finishing stage for visuals and measurement. Finishing checkers check the complete garment inside and out. Checking is done for garment detailing, such as care labeling, and trims. Products those have trimming like button, snap button, eyelets are attached in finishing section. Stains and spots are found on garments. Spots are removed using a hand spot gun or by using a stain removing machine prior to pressing. Dust and stains can be removed by machine washing. So, many times finishing department wash garments inside department. Defective garments may need to repair for stitching and fabric defects. All repair activities are done in finishing department itself instead of sending defective garments to stitching department. Garments are ironed using a steam iron. This is done to remove creases in the garment. For knitted garments measurements are set by steam press. Vacuum pressing tables are used for garment pressing. Pressed garments are folded in a specified dimension. Tags, such as price tags and hang tags are attached to the garment by means of a kimble gun or threads. Finally, properly folded garments are packed into poly bags as per customer requirements. Individual poly bags are then packed into bigger cartons. The packing in-charge prepares a packing list for the shipment. After packing is completed for an order, the finishing department informs the concerned merchant. Quality department perform internal shipment audit in the finishing department. This audit is done prior to final inspection. Like other departments, finishing department maintain production records for pressing, and packing. This article is a tiny part of my latest book "Garment Manufacturing: Processes, Practices and Technology". Learn more about garment production from my book. Various activities of Finishing Department in Garment Industry.